Sunset at Cape Hatteras, North Carolina . A classic Etruscan vase sunset imaged by Michael Myers (site) as he looked westwards over Pamlico Sound towards the mainland. ©2002 Michael Myers, reproduced with permission. As the sun descends a second sun rises from the water. Eventually the two join at a red hued vertically stretched 'stem' (4th image - larger version here). Jules Verne likened this appearance to an Etruscan vase. 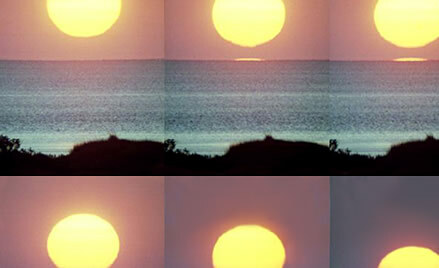 The stem shortens and thickens until the two suns (6th image) appear like a Greek letter omega. The suns continue to merge until eventually only a discus shape remains. 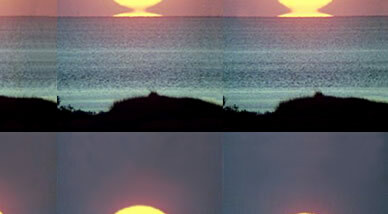 Sometimes the discus shrinks to finally form an I-Mir green flash as in this example showing a similar sunset . The lower sun is not a reflection from the water. It is an 'inferior mirage', so named not from any poverty in appearance but because the miraged sun is below the 'real' one. The lower sun is an inverted image produced by refraction by a layer of warmer and less dense air close to the ocean surface. The discus shape is a combination of the upper limb of the erect sun and an inverted image of it beneath. A fuller explanation and a ray diagram are here in the section about green flashes.